Last evening I had a game with James (Kenny) Milner before he heads up north to Guardcon. Given that there are going to be four OKs armies out of the 24 participants, we thought it worthwhile for him to have a run prior. So James' army is a very slippery eel.....lots of redirectors, a Deathstar with hooks and shooting/magic to force the issue. Now we decided to play Battleline - because for all my brave words re scenarios - it's the easiest and quickest to get into. You will have to excuse the poorly focused photos but they will give you an idea. Archers and Eagle on extreme left with Reavers (out of picture). Swordmasters then White Lions - Lord and BSB (separated by more than 6"), big Archers and Level 4 in Building then Archers, Archers + Level 2 and Reavers on right. On far left is a single Sabretusk.Then Mournfang in a Blood Forest, the Bulls with BSB, Guts with Slaughtermaster and Butcher with Ironblaster behind. The Dragonhide Mournfang with another unit behind (eagle eyed readers will note that these look like two Tomb king chariots - this is correct. It is also because Charlie is a lazy minger who prefers to work and win the ATC than paint my next two mournfang). On the far right out of picture are two sabretusks. 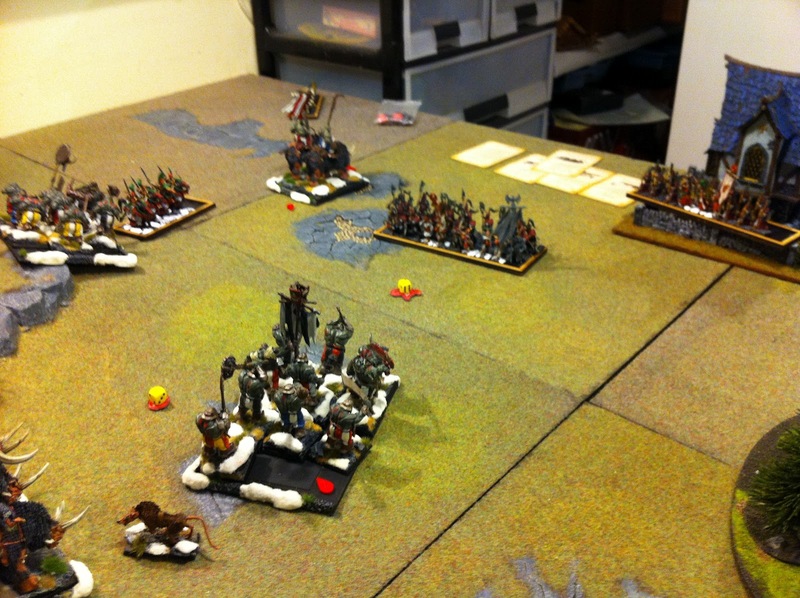 The Ogres won first turn and pushed the Mournfang forward. Too far it seems! 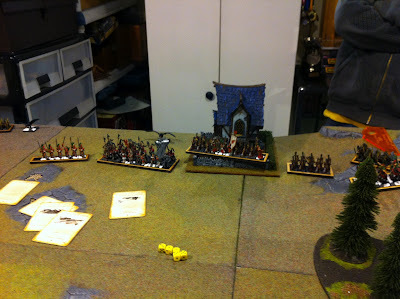 James charged one unit with the Swordmasters and the big unit with the Lionstar. My Mournfang decided that the White Lions were scary so fled back through the Guts and Bulls. James was also throwing down comets while on my right he tried to delay the Ogre advance. I realised that I needed to pick up points before engineering a multicharge on the Lionstar so focused the TK Mournfang and magic on James archers. My Ironblaster lasted three turns. It misfired Turn 1, killed an archer Turn 2 and destroyed itself Turn 3. At the same time James picked up my sabretusks while one of my Mournfang killed the swordmasters and the other got into archers. You can see two comets down - in front and to the side of the Guts. The Dragonhide unit has rallied and the Mournfang have seen off the Swordmasters. 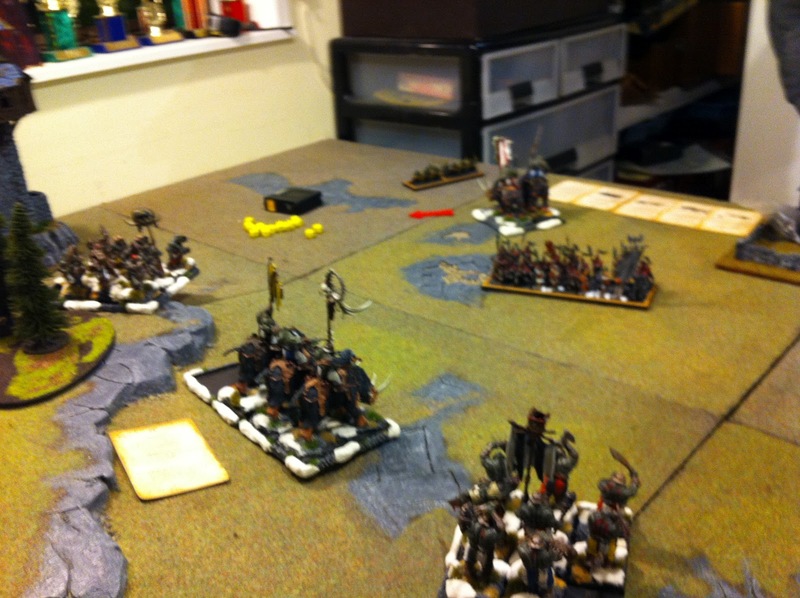 Away out of shot the TK Mournfang are chasing archers having been flank charged by Reavers at one point. The other Reavers are annoying my Bulls. In the next turn the Lionstar charges the Bulls who flee out of danger. Comets explode killing one Mournfang, the Gutstar having Trollguts on it (largely to dissuade the Lions from charging them). My TK mournfang kill the Level 2 but her unit gets away delaying my return to the fight. In the final turns I move my Dragonhide unit forward tempting a charge from the Lions but James realises that he will wear the Guts and Bulls in flanks if he makes it - and all three if he doesn't. He is risking an awful lot of points for my 350 point unit. Deciding dicretion is the better part of valour he pulls back. The last act of the game was a charge from a lone Butcher on archers with the Level 4. He won the first round but didn't kill the witch. He was only on a single wound but protected by Troollguts. In the final Magic Phase the Level 4 miscast to inflict the Str 10 hit that killed him. 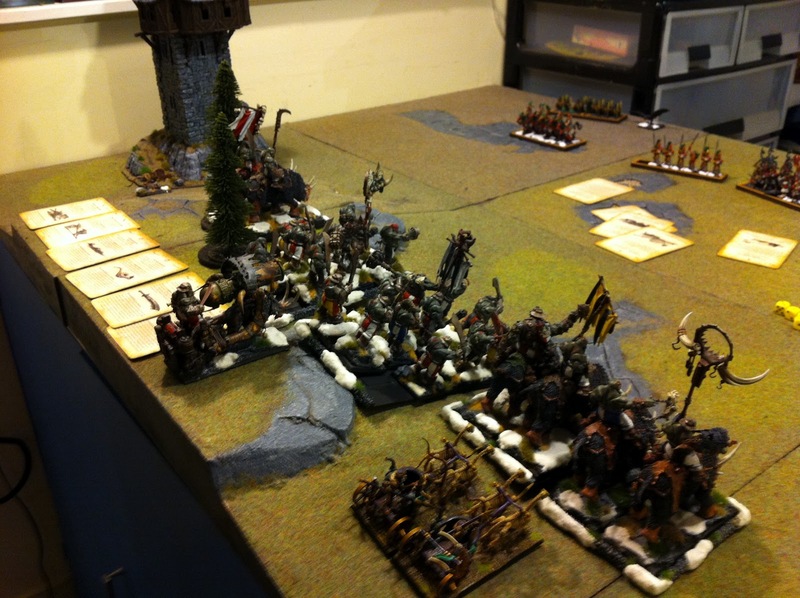 In the end the Ogres were up by just over 500 points - losing the Butcher, the three sabretusks and the Ironblaster. James had his Level 4, some archers and the Lionstar with characters. It was a very good game, extremely cagey because we were both worried by the other's toys. I was determined the lionstar would not get a one-on-one fight looking to put together the multicharge that gave me enough impact hits to reduce the damage back. As to my list I remain unconvinced on the big Mournfang unit. To me it looks like too many points to concentrate in a non-character unit. Guess it is just my risk-averse nature.